The Cleveland Browns did not wait long into free agency in addre ssing their largest need position,as they worked a deal with the Green Bay Packers to acquire defensive tackle Corey Williams in return for the Browns second round pick in the upcoming draft. 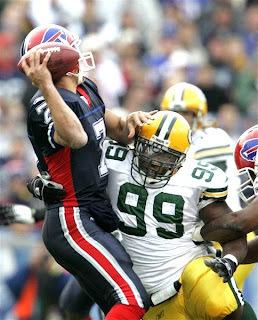 Williams was tabbed as the Packers franchise player after consecutive seasons of 7 sacks from the DT position and looked have been ready to cash in for a big contract in 2009 after the franchise tag expired,but part of the deal requires that Williams be signed to a multiple year contract. Williams is 27 and has excellent size at 6'4,313 and seems to have excellent pass rushing skills at the hardest position to find pass rushing skills,so this seems like a good deal. But to be sure,we went to the person that knows the most about the Packers and therefore Williams. Ryan has watched Williams play for his entire career in Green Bay and we asked for his thoughts on the newest Brown. "Solid player, but can't play every down. Is most effective in a rotation at DT. More of a Sapp-type pass rusher from the tackle spot than a pure run-stuffer." "Williams wore down late in the season after the Packers suffered injuries on the line, forcing him to play more snaps." Overall,I like the deal as something had to be done to help the weak pass rush and the cost is pretty reasonable for a player in his prime,but having no picks until the middle of the third round does not thrill me very much. 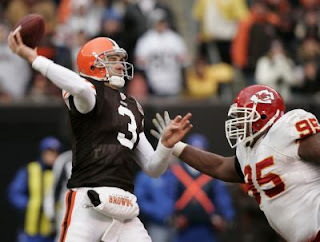 In more good news,it appears that Derek Anderson could be s taying in Cleveland. There are still some contract details to be ironed out,but it appears that Anderson has agreed to a three year deal worth 20 million,with at least 10 million of that guaranteed. NFL contracts are inflated,as much of these huge contracts are not guaranteed. Smart move by the Browns as you keep the productive player,but the deal is not long enough to be a franchise backbreaker,if Anderson does not continue his level of play. AT the same time however,a trade is still very possible for Anderson. I just cannot see Cleveland staying pat and not picking in the draft until Round 3. Ryan sends a "questionable" YouTube clip today of our least favorite Hockey blowhard Pierre McGuire from TSN trade deadline show in which Pierre seems to confirm what most Hockey fans have thought for quite a while. The New Jersey Devils battle Washington tonight at the Rock. Here is hoping that they find the scoring touch that they packed away somewhere lately. The Pirates won their spring training opener over the Philies 11-5 yesterday. Look for a lot of Pirate talk,but not a lot of game coverage unless the game happens to be televised and I get to see it. The bigger story was Tom Gorzelanny missing the start with shoulder soreness. It is supposedly minor,but with the Pirates background in these matters (Brad Lincoln just had an oblique strain this time last year),one can understand any trepidation that Pirate fans would have on this. Gorzelanny is supposed to start on Sunday and that would go a long way to easing worries. Why is this more worrisome then it normally would be? Because Jim Tracy really abused Gorzelanny late in the season in his desperate bid to retain his job and overused him in meaningless September games and therefore has Buc followers waiting for the next shoe to drop. Gorzo pitched over 200+ innings,which was not just a career high but was over 40 innings above his previous top number. Arkansas State officially retired the Indian family last night in Jonesboro and will begin the transition to the new name of Red Wolves. We first talked about this back in July. ASU waves goodbye to their tradition in order to make some people at the NCAA pleased. When will someone wake and realize that the NCAA has long outlived its usefulness and needs a major revamp, if not outright removal. Battlin Bob sends us the link to the new website of the Pulaski Mariners and the logo looks pretty cool and I hope the hats look as good! The Poll ended and it looks like casual coverage of the AL teams carries the day. Cleanin out the inbox of stuff that I wanted to comment on from times past. I really have to do a better job of this! Last Saturday night Wladimir Klitschko added the lightly regarded WBO belt to his IBF heavyweight title in a lopsided,unanimous yet dull win over Sultan Ibragimov. We figured Wlad would win and he did,but rarely threw his powerful right hand and instead settled for using his dominant jab for his mode of victory. We scored the fight 118-110 for Klitschko. 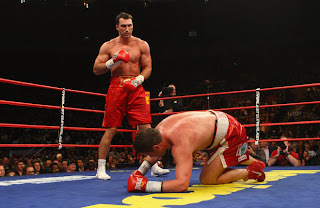 Winning is the most important thing and he did just that,but Klitschko gained few fans in his win. "Dr.Steelhammer" should be going after the winner of next weekends WBC title fight between Oleg Maskaev and Samuel Peter,but instead it appears that oft-injured brother Vitali has the family endorsement for that fight. Add to that the problem that WBA champ Ruslan Chagaev is not a name in the USA and has a rematch of his own against the giant Nikolai Valuev and you do not have a recipe for further unification or even a decent next opponent for Klitschko. Battlin Bob sends us a mail on the "struggles" for poor Sam Zell. Zell is the new owner of the Chicago Cubs by virtue of his buying the Chicago Tribune company and instead of selling the Cubs and Wrigley Field as a unit,he is trying to sell them separately and therefore make more coin for himself. The problem with this is that the process has been slowed down considerably by Zell's insistence and the deal may have to wait until 2009 to be completed. I feel so bad for Zell. Thanks to those of you in cyber space that made last Saturday our all time highest day for visitors. Another cap tip to our friends over at Wooden's world of baseball for mentioning us in their latest post. Wooden does great stuff over there and I would encourage anyone to visit his blog often. For those of you minor league fans out there,I just finished my minor league fantasy baseball draft and I will be looking at the players in my system here on a slow day. If anyone wants to look at the draft (which is still going on) click here. The lovely Cherie sends us a few non-sports items to opine on. This talks about a rubber-like substance that is self mending and would be a help in things like easily broken toys,utensils in the kitchen etc. I would imagine using it in a medical purpose down the road. Think about a possible benefit using this in a Tommy John patient? That is years away,but think about those possibilities! 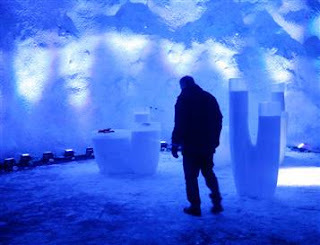 In the Norwegian mountains,a chamber is being dug 400 feet in to a frozen mountain and reserving seeds in the event of a catastrophic disaster. 88 Countries are participating in the project and the vault can hold up to 4.5 million species of seeds to be housed there. This is a tremendous idea and is the type of thinking that is needed as so many things on our planet change. Never a bad thing to have a "Planetary Pantry"for the worst of all bad days!! And finally,Cherie in another search stumbled upon this. This is something that you likely will never see this blogger attend for more reasons than you can think of!!!! The New Jersey Devils have won a 2-1 game in overtime and lost won exactly the same way two nights later. First the win on Sunday afternoon at Washington and honestly this game never goes to overtime at all without the worlds greatest goalie between the pipes for New Jersey. Marty Brodeur was virtually a one man show in the victory that probably should not have went to the Devils. I do want to give plenty of credit to the Capitals goalie Brent Johnson,who was also superb in goal despite the tough loss,but this game showed the possible achilles heel for the Devils as a backup goalie pretty much held them in check throughout. This team needs to pick up the offense and the players that played in this game are going to have to do just that,as the Devils made no noticeable offensive acquisitions at the trade deadline that would arrive two days after this game. Neither team was able to bust through the scoring column until Jamie Langenbrunner slapped a shot(11) by Johnson from the left circle on a 5 on 3 Devil advantage to give New Jersey a 1-0 lead. Washington tied the game less than two minutes later and that concluded the scoring until overtime. That is where the puck bounced the Devils way as a Patrik Elias shot bounced off John Madden and then deflected off a post. The puck was then backhanded by Madden(18) by the sprawled Johnson into the net for the win. This winning credit goes to Brodeur and the Devil defense for keeping the game close enough to have things go their way. But two days later in Carolina,the score was same,the play was similar,but this time the puck bounced the wrong way as the Hurricanes stopped the Devils 2-1 in overtime. At least the Devils can take solace in getting a point out of the game,but the offense was again MIA. Marty Brodeur was again terrific,but Sergei Samsonov was able to beat him once in regulation and again with the game winner in OT. No other Canes were able to solve Brodeur and honestly if a breathing human instead of Andy Greene had been on the ice against Samsonov,the Devils would have skated away with a W.
I have tried to be easy on the developing Greene,but his play in this game was horrid and basically cost the Devils the contest. On both goals,he allowed Samsonov to drive to the net with impunity and gave him free rein. Look for Greene to be scratched for a few games and either newcomer Brice Salvador or one of the veteran scratches,Vitaly Vishnevski or Karel Rachunek returning in his place. The only Devil to dent the twine was Brian Gionta with his 17th of the season. What does it tell you when a fight gets you the Bronze star? Well,that says volumes about the Devil attack and in a nutshell,the Devils are ripe for a playoff upset early,if their idea of an offense is squeeze out 1 goal and pray Marty is perfect. I like the pickup of Bryce Salvador. Although this is not a impact addition,it does help the defense and considering the cost was a fighter that has not played a game all season-I REALLY like it! Bryce will not help the offense much,but will add a veteran presence that the defense (especially after Andy Greene's performance) could really use. After all he was a + 12 for an average St.Louis team that shows his commitment to the defensive end and Lou Lamoriello compares his game to that of Colin White and that type of steady play is just what the Devils need. Take all of those factors with the next to nothing that the Devils gave up and that if Salvador does not play well,he will be free to go as he is a free agent at season's end and you have basically added a player to help the squad at little cost or risk. Compare that to the exorbitant price paid by teams such as Pittsburgh and Washington and I feel pretty good about it. I will miss Cam Janssen,but he had not played all season,his spot had been pretty much taken by the more offensive and just as aggressive David Clarkson and there did not seem to be a place for him in the lineup. I do think that Lou Lamiorello sent him to St.Louis as a favor for his time in New Jersey as St.Louis is the hometown for Cam. 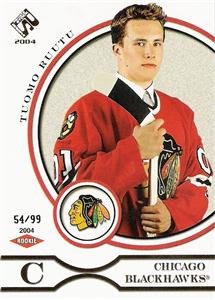 I wish that I could say that I liked the Blackhawks trade of the gritty Tuomo Ruutu to Carolina as much. The Hawks swapped Ruutu for left winger Andrew Ladd. Ruutu was so excited to leave Chicago,he managed to make it to Raleigh on time to play for Carolina in their win over the Devils. Ruutu adds versatility to the lineup as he can line up at center or left wing,while Ladd is simply a winger. Maybe it is because I have always liked Ruutu and his game,but for now,the Canes look to have the edge in this deal. Back later with more cleaning of the inbox. The New Jersey Devils finally figured the New York Islanders out and defeated them for the first time this season in a 4-2 win at the Rock. The Devils overcame a early Islander lead with two first period goals from both of their special team units. Patrik Elias scored the tying goal (17) on the power play and then John Madden lifted the Red and Black to the lead with his shorthanded goal (17). The special teams have really picked up their pace lately and they seem to catching fire at the right time,especially Madden,who seems to have rediscovered his shorthanded touch from past seasons. After the Islanders tied the game with the only goal of the second period,Zach Parise scored(25) the game winner with a beautiful breakaway goal to beat Rick DiPietro. A blurry fast relay after a rejected shot by Marty Brodeur bounced to Travis Zajac and was quickly passed to the breaking Parise was a joy to watch. Brian Gionta finished the game with his 16th goal of the season after a Colin White pass/shot found its way to Gionta's stick for the easy put in past the prone DiPietro. Solid effort for the Devils to end the homestand and quiet the critics (me included) on their efforts against the rival New York teams. The Devils travel south tomorrow for a 3:00 game in Washington vs the Capitals. Today's neat youtube comes from Battlin Bob with this 1960's NFL studio show. One-I love the classic logos that are shown. Two-Brought to you by Marlboro,that is one that you will never see again! Three-Think the Native Americans would have any problems with the Redskin cartoon today? Now for some random notes notes from the non-sports world from the lovely Cherie. Look at this map for the results of human activity on our seas and oceans. Their is no water area that has been untouched and 41 % has been heavily affected by human activity. I wonder if generations to come will even be able to have the luxury of fish or swimming in a ocean and that is quite a shame. This is tremendously interesting to me. After a lengthy conversation on evolution and how things were and evolve,this showed up in my inbox. Great stuff and I was especially interested in the future humans. Check out the Survivalistans and their look. Evolution is controversial,but I fail to see why. If this does not tell the tale of the difficult decisions that we have to make,nothing will. Alaska has to make the decision of Polar Bears or a pipeline for Natural Gas. I understand the need for the Natural Gas and the money that building it would bring to the economy,as it would be the largest private sector project EVER in North America,but is worth the cost of the Polar Bear,which uses the Great White North as its only habitat? Lots of stuff to comment on that has been cloggin the Inbox,so a long edition of Random Ramblings usually cleans this up. This is a few days old,but I must say that Doug Mientkiewicz is either the ultimate bench guy or one smart fellow in using the media to help get a roster spot,because he sure said all the right things in this interview with the Post-Gazette. Finally,a veteran to come to Pittsburgh that gets the idea that past their prime veterans can contribute without having to be an everyday player. The Pirates also added another member to the arson squad in Byung-Hyun Kim. Kim signed a one year deal for 850g thats carries as much as a Million more in incentives. Not sure what he has left,but he has always been more effective in a relief role (which Pittsburgh plans to use him in) and the cost is right. Plus,I have always liked the entertaining throwing motion as well. The Cleveland Browns chose not to take my advice on Jamal Lewis and signed him to a three year,17 million dollar deal. The Browns will say that only 6 or 7 is guaranteed payout to Lewis and money out of pocket wise that is true. But all the money counts towards the cap,if Lewis is a Brown in three years or not. I question the length of this deal,but time will tell the tale. In a move that I do agree with the Seahawks used their franchise player tag on Pro Bowl cornerback Marcus Trufant. Marcus had a terrific season and appears to have plenty left in the tank. Good shutdown corners are hard to find and kudos to the Hawks for keeping Trufant in Blue. A great article on one of our all-time favorites from the pro wrestling and college football worlds,Steve "Dr.Death" Williams from the Denver Post. The Doctor is still recovering from his throat cancer and has moved back to his native Colorado to take care of his ailing mother. His 1993 match vs Kenta Kobashi (remember that name for future reference) ranks as one of my top 5 matches of all time. After the Cleveland Cavaliers pulled off their deadline deal that brought two of my favorites to Cleveland in Wally Szczerbiak and Joe Smith,I actually wanted to watch an NBA game for a change. Although none of the new Cavaliers played in the ESPN televised game against the Wizards all 4 were in attendance. 4 quick observations on the Cavaliers and the game. 1) This deal will help Cleveland more than anyone can imagine. Ben Wallace to do the dirty work under the boards will allow Zydrunas Ilgauskas to play the finesse game that he is most effective at,Szczerbiak gives Cleveland a much needed jump shooter,Delonte West is the young point guard that is needed to give Eric Snow less time and Joe Smith should be able to replace Drew Gooden's numbers. 2)I like and will miss Drew Gooden. The rest of the traded players can go with good riddance. And includes you Larry Hughes! 3)Nice to see ESPN find something for the classy and professional Heather Cox to do. Cox lends a needed sense of professionalism to the "sideline" position and deserves more time than the current ESPN favorite Erin Andrews. 4)The Wizards uniforms are horrid. Take a hint from your sister team ,the Capitals, and go back to the old unis. Apparently there is another Heather Cox that participated in the American Idol garbage. This is NOT the ESPN employee. I don't watch this stuff,so I was not aware of this person until my search for a link to the ESPN reporter. Devils later today vs the Islanders. Back later with Devils and a whole bunch of Bullpen Notes on various things from the non-sports world. Devils win two at the Rock. Missed a lot of time haven't I? And it could be more as a "winter event" charges into the area tonight and the possibility of being stranded at work until Saturday morning is looming as a possibility. So considering that,I suppose that I should catch up before things really get out of control. The New Jersey Devils won both their games this week at home at the Rock with wins over Carolina 5-1 and San Jose 3-2. The Carolina game was one of those holiday matinee games and the Hurricanes looked weary and overmatched. New Jersey leaped out to a 2-0 lead in the first period behind goals by T ravis Zajac (13) and Mike Mottau (4) on the power play and never was threatened again as Marty Brodeur was top notch all afternoon. Sheldon Brookbank was activated for the first time in 20+ games and picked up an assist on the Zajac goal. I have a soft spot for guys that worked their way up through the minors and earned their way to the top and Sheldon certainly has done that and kudos to Brnet Sutter for activating him for this game against Sheldon's brother (Wade) of the Hurricanes and enabling the family to attend and enjoy the contest. 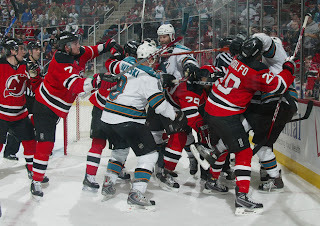 Jay Pandolfo (11) opened the second with a goal and Johnny Oduya(4) sandwiched their goals around the only Carolina lamplighter of the game before the Devils finished the game off with Zach Parise scoring his 23rd as the only goal of the final period. The Devils dominated both ends of surface with hard nosed,physically banging play and the Canes certainly were not able to match the Devils effort on this day. Not much more that I can say about this one other than-GREAT!!! Last night the San Jose Sharks and personal favorite Joe Thornton visited the Rock for the only time all season. First off,the 3-2 final was deceiving as both Shark goals were flukey. The Cheechoo goal in the first was a combination of Cheechoo making a quietly excellent play and the puck taking a crazy bounce off the boards to slide through the crease. The McLaren goal was deflected by Brian Gionta by Marty and those things will happ en in hockey. So I hold Marty pretty much blameless for either goal. The Devils won this one with 1 excellent period of play and 2 decent ones as all three Red and Black goals were sent home in the middle period. Zach Parise tied the game at 1 with number 24 of the season off a great pass from Jamie Langenbrunner,Patrik Elias picked up the secondary assist on the goal. With three minutes remaining in the period,the Devils popped in the two goals that would mean the difference in the game. John Madden scored number 16 of the year to snap the tie and give New Jersey the lead with Sergei Brylin and Paul Martin assisting. And just 1:08 later Sergei Brylin scored what proved to be the game winner (6) beating Shark goalie Thomas Griess with under two minutes to go. Anytime the veteran Brylin plays well,it always makes me smile as Devils fans remember his solid professionalism through all three title winners without drawing a ton of attention to himself. San Jose did not mail the game in as Carolina did on Monday and continued to make this a interesting game to watch,but the Devil D held its own and grabbed the two points. The Devils play the Islanders (OH NO) Saturday at 1. Looks like Toshiba is preparing to toss in the towel in the High Definition DVD battle against Blu-Ray discs. Battlin Bob sends us this link on the decision. Its a Battlin Bob twin-killing in Bullpen Notes as he sends us this link on how the vanishing Honey Bee could make a huge difference in Ice Cream flavors and prices. The bee problem is larger than one could think,due to up to a third of the food that we eat is pollinated by Bees. A possible reason for this problem is due to a virus that is the final straw among many reasons that are killing off the Honey Bee. Scientists think that this theory is workable,but not the total answer to the problem. 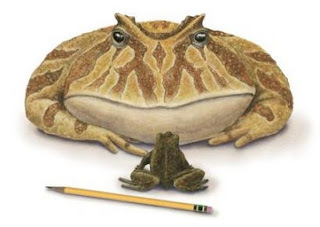 In other animal news,the Beelzebufo frog or "Devil Frog" hit the news with its size and reputed to have been the largest frog ever in the Dinosaur age. In fact,this frog was so large,it could have eaten hatchling Dinos-Now that is a big frog! Beelzebufo is reported to be an ancestor to the "Pac Man" frog that reptile enthusiasts can find at a good pet store. And wrapping up with more of this screwball version of Bullpen Notes. 1988 Kentucky Derby winner Winning Colors died last Sunday at the age of 23. Winning Colors was the last filly to win the Derby and was the first winner ever for trainer Wayne Lukas. Winning Colors is also remembered for her effort that year in the Breeders Cup Distaff,where she was nipped at the wire by the miraculous late charge of the undefeated Personal Ensign in Kentucky. The race capped the undefeated career of Personal Ensign,who retired after the race. Arron Asham rebounded from his game-ending shootout miss against Atlanta Friday with goals in each of the first two periods and added an exciting fight with Senator tough guy Chris Neil in leading the Devils to a 3-2 win in the Canadian capital. Asham's first period goal (5) deflected off the Senators Daniel Alfredsson to elude Ray Emery,but his blazing shot in the second was all Asham as his goal (6) gave New Jersey a 2-0 lead. Zach Parise then added a power play goal(22) later in the period and the 3-0 lead looked secure as the Devils were playing well. However Ottawa began to pick up the pace and the Devils began to play the Senators game and the game became a up and down battle and that does not favor New Jersey. It was fun to watch though and Marty Brodeur stepped up and saved the day. A rare puck-handling miscue by Brodeur gave Ottawa their first goal in the 2nd period to cut the lead to 3-1 and the Senators trimmed the deficit to a goal with the third period's only goal. A great game to watch and to the Devils doubters that believe that they can only play dull games,this was proof against that. The Devils play tomorrow at 1 on President's Day at the Rock vs Carolina. 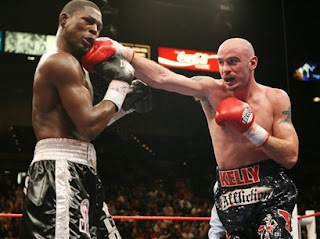 Kelly Pavlik earned a unanimous decision over Jermain Taylor in their Super Middleweight battle last night in Las Vegas. The fight will be replayed next Saturday night on HBO with the live coverage of the Wladimir Klitschko-Sultan Imbragimov fight from New York. Doug Mientkiewicz must be desperate to earn a roster spot with the Pirates,as he is taking grounders at both second and third base and shagging outfield flies to increase his versatility. Smart move by the veteran,as the more things he can do makes it easier to keep him on the roster. The same column notes that Josh Shortslef was moved from major league camp to minor camp with weakness in his shoulder. Shortslef was a long shot to make the club to begin with,so this does not appear to change much in Bradenton. The lovely Cherie sends us this slide show from Newsweek that relates to our note earlier this week on the shrinking Lake Mead. Lake Mead and several others are shown on the "Losing our Lakes" feature. Take a look at these and tell me that we do not have a problem. And finally for all you Carpenters fans out there,looks like their former home will be torn down as the current owners have had enough of fans always peeping around. A group of fans are attempting to have the home declared a historic landmark for the Carpenter fans version of Graceland as one fan was quoted in the article. Devils lose 10 shot shootout,Moskos moves to the rotation. With seconds remaining and the Atlanta goalie pulled,th e race was on. A New Jersey game clinching clear of the puck? Or a game tying Thrasher goal? Unfortunately for the Devils,it was Marian Hossa from the team with the garish uniforms bouncing the puck by Marty Brodeur and tying the game and led to a scoreless overtime and then a 10 player shootout before Atlanta staggered away with the 4-3 nod. Zach Parise scored the only goal of the opening perios with his 21st of the year and Brian Gionta's power play goal(15) opened the second period scoring. But two Atlanta goals tied the game going into the second intermission,but the Devils took the lead in the 3rd with John Madden scoring his 15th of season and that led into the traumatic ending. The long shootout losses are heartbreaking just because you see the type of players that are shooting in it,although that can be kinda fun in a way as long as you win. Devils that made attempts in shootout included Karel Rachunek,Sergei Brylin and Arron Asham,whos miss ended the contest. The Devils are in Ottawa tonight at 7 for another game against the Senators. Big fight tonight in Las Vegas as the contractually obligated rematch between Kelly Pavlik and Jermain Taylor of their great fight for the Middleweight title a few months back. This fight is at Super Middleweight limits as the contract stipulated,so if Taylor wins the bout,Pavlik will keep the Middleweight title that he won in the first contest. Our prediction is Pavlik with a late round KO. The Pirates started in Bradenton with a surprising announcement that controversial first round pick Daniel Moskos would be a starter this year,not a reliever as he was drafted as by Captain Dave Littlefield and his nitwitted comrade Ed Creech. I love this move,as this will give Moskos more of a chance to develop his pitching toolbox and build up arm strength. If it does not work out,one can always move him back to the pen. Moskos is expected to start at High A Lynchburg and we will see him and the Hillcats early,as they open in Frederick this season. The Chicago Blackhawks are rumored to have offered Peter Forsberg a huge contract to finish this season and the next two as a Hawk. Not sure I like this deal,as Forsberg has become increasingly brittle over the last few years and the Hawks could end up eating most of this deal. But it would be a show of goodwill to the long suffering fans in the Windy City. Looks like a winner is starting to develop between Blu-Ray and HD in the battle for high definition video dominance. Wal-Mart announced they will shortly be carrying only Blu-Ray discs. Wal-Mart goes a long way in picking the winner in the business battles. I did not really care which format became the kingpin,but I sure was not buying a HD player until this situation shook out. Ryan sends us word of the passing of comic writer Steve Gerber at the age of 60. Gerber is most noted for creating the cult classic character Howard the Duck and creating some great books. The other thing that one can credit Gerber for is having little to do with Howard's movie-which gave new meaning to the word putrid! Hagerstown snubbed again or is it their own fault?? A small note in Ballpark Digest led to this article and more of the frustrations with the state of Maryland came back to bother me again. The state and Governor Martin O'Malley has given a 7 MILLION dollar grant to Waldorf MD for a new stadium for a Indy league team,the expansion Southern Maryland Blue Crabs. This adds to the number of NEW stadiums that have been built in this state since the existence of the Hagerstown Suns and the city of Hagerstown (with a few minor improvements) basically have the same stadium conditions since the Suns arrival. The following cities have added new facilities since that date-Baltimore (Orioles),Bowie (AA),Frederick (High A),Salisbury (Delmarva,Low A),Aberdeen (Rookie) and now Waldorf. Meanwhile,Hagerstown struggles along and gets zero assistance for any stadium help. Could it be that the county usually votes Republican in a solid Blue state? Perhaps,but under GOP Governor Bob Ehrlich-There was no grants or credits that came to the Hagerstown/Washington County area either. So this led me to write the Governor a letter and here it is-word for word. If I get a response back,we will post here for equal time. I just wanted to bring an interesting fact to your attention after reading of your office agreeing to give a 7 million dollar grant to the City of Waldorf to help with their new baseball stadium for their new baseball team. This brings the total of new stadiums in Maryland to Six since the Hagerstown Suns arrived in 1982 and the city of Hagerstown and their affiliated team continues to play in a 70+ year old facility. The Suns and this city deserves a field to be proud of and this Democrat would be satisfied with a renovation of the stadium,similar to that done in Lynchburg VA.
Why do other cities continue to get help from this state while Hagerstown continues to play in a sub-standard stadium? Is it because the area is a solid GOP stronghold in a Democratic state? I fear that the state of Municipal Stadium will eventually cost this area their professional baseball team and as I am sure that you know with a stadium in this shape,that a new team will be highly unlikely to return here. My other question on this topic is this. Has this area in Western Maryland applied for any grants/help for stadium improvements? One cannot "grant" what one has not been asked for. Thanks for the time and I would implore you to visit Municipal Stadium the next time that you would make a visit to Western Maryland. The New Jersey Devils host the Atlanta Thrashers tonight at the Rock in the second of a 4 game,six day run. The Devils travel to Ottawa tomorrow for a return match against the Senators before returning home for a Presidents Day matinee' game against the Carolina Hurricanes. Former Cleveland Plain Dealer columnist Chuck Heaton passed away at the age of 90. Heaton is more notable to most as the father of actress Patricia Heaton,but stood on his own merits to those in Northeast Ohio. Great article on Rivals.com on the struggles of basketball programs that rise to Division I from levels. I realize that it comes down to bucks,but when you look at the road schedules that these teams play you must wonder how much education is going on. Funny the NCAA has no problems with this,but they are hardline on missing classes for a potential football playoff. Ryan sends us this note on the retirement of Oakland catcher Jeremy Brown. Brown was the famous "bad body" catcher in the Michael Lewis book Moneyball. This leads me to thinking about a future slow day post on the players mentioned in the book,as their draft turns six this year. Take a look at the new poll-It is an important one for this year's coverage. Brian Gionta's goal 2;14 into overtime gave the New Jersey Devils a 3-2 win and a badly needed two points last night in New Jersey. The win moved the Devils to just one point behind the Pittsburgh Penguins in the Atlantic Division title chase. The Devils scored two goals in less than two minutes in the second period to erase a 1-0 Senator lead and turn it into a 2-1 Devil advantage. 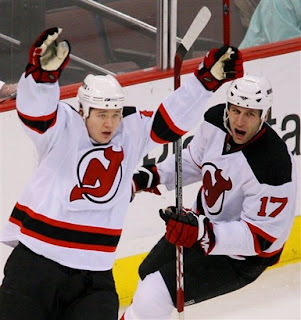 Jamie Langenbrunner's shorthanded goal (10) tied the game and Karel Rachunek's 4th of year on an offensive rush gave the Devils the lead. Most readers know how much I like Langenbrunner,so any words on the captain are already known,but Rachunek just frustrates me so much. Rachunek will play terrific for 2 or 3 games,attacking the offensive zone and looking like he is finally living up to his ability and then it leaves as quickly as it came. I guess when it comes to Karel Rachunek,you will just have to take whatever production that he gives and realize that he is just going to be the type of player that will never live up to his full potential. Patrik Elias assisted on both goals,while Zach Parise added an assist to his total on the Rachunek goal. Ottawa tied the game late in the third,but the Devils broke the "non-aggression" pact that seems to exist in tie games when John Madden roared down the ice on a breakaway against Ottawa goalie Martin Gerber,but Gerber was able to swat the Madden shot aside and no other threats came along during regulation. Onto the extra period of play and the game winner. Gionta fired a shot that bounced off Gerber and Jamie Langenbrunner pounced on the rebound and Gerber made an excellent save on the captain's shot,but the puck bounded back towards Gionta and number 14 then finished the contest. A good game and the rematch takes place in the Canadian capital Saturday night,after a Friday night contest at the Rock against the visiting Atlanta Thrashers. Yesterday,we commented on the players that the Devils are rumored to be in talks with before the trade deadline. Well,at intermission of last night's game,you can add another to the list. Mats Sundin was mentioned as a possible target,but of course he would be a target of most teams. I would love to see Sundin in Red and Black,but I would consider the Devils an also-ran in that race. Former Pirate Kris Benson signed a minor league deal with the Phillies. The 33 year old Benson is expected to be part of a multiple man battle for the Phillies final rotation spot. I would have liked to have seen Benson return to Pittsburgh and that would have given the Pirates some depth in their starting corps and perhaps set up a future deal down the road. C.C. Sabathia announced that he has ended talks with the Indians until the end of the season. The Indians had offered the burly southpaw a contract that would have spanned 4 years and paid 17 to 18 million per year. Sorry that I missed the last two days,but life throws curveballs to us all. Monday was wonderful as I was lucky enough to sit in a garage for a few hours and pay hundreds of dollars to do so,while Tuesday brought snow and ice to the region and not much to comment on. The Pirates signed veteran first sacker Doug Mientkiewicz to a minor league contract. The smooth fielding lefty bat looks like a questionable signing on the surface with current starter Adam LaRoche a lefty hitter also. However after one peels the onion a few layers,perhaps the Pirates are quietly shopping LaRoche. LaRoche is under contract for the year at an affordable price and could get some decent prospects in return. That in turn could give Steven Pearce the first base job and then Mientkiewicz makes sense as a mentor and late inning defensive caddy. We did vote in the Maryland Primary yesterday and voted reluctantly for Barack Obama. The Illinois Senator was far from my top selection,but compared to his opponent was more to my liking. The New Jersey Devils are rumored to be looking at several trade prospects before the deadline and some of the names would be quite an upgrade. right winger Martin Havlat,Tampa center Brad Richards and two top notch defensemen in Buffalo's Brian Campbell and Tampa's Dan Boyle. Either of the defensemen would help and Jokinen would be a tremendous addition,as would Havlat,if he could kick the injury problems that have trailed him over his career. The Devils play the first game of their 3 games,4 days run against the high flying Ottawa Senators tonight at the rock. Looks like the 2009 move of the Columbus Catfish to Bowling Green Kentucky is one step closer to a finished deal. The city of Bowling Green has agreed to build a downtown 4,000 seat for the SAL franchise as part of a downtown rejuvenation plan. Meanwhile,Hagerstown with more population in its "metropolitan area" prefers to use its downtown funds on "blues fest" and "octoberfest". The lovely Cherie sends us a few notes from the environmental side. Lake Mead ,which is a major link in the Colorado River chain and has been under drought conditions for the last eight years, has a 50 percent chance of going dry by 2025 according to a study released this week.. The lake is losing millions of water acres each year. London is beginning to tax gas guzzling vehicles at a rate of almost 50 dollars a day that enter the main portion of the city. New York City is supposedly considering a fee to drive your car into the center of their city as well. Now I would not want to pay that type of fee,but then again-I would not drive that type of vehicle either! In a dominant performance,the New Jersey Devils crushed the visiting Carolina Hurricanes 6-1 behind 4 goals from the defensive corps. And we promise no Neil Young or Scorpions references this time! Paul Martin scored two goals(4 and 5) to lead the team,while Colin White started the scoring with his second of the year in the first period. But the goal of the night went to Johnny Oduya (3) with a end to end solo rush to beat Cam Ward. We give Oduya a lot of ridicule here,but that was one beautiful goal! Dainius Zubrus snapped a long scoring drought with his 9th of the season on a second period powerplay. Jay Pandolfo's 10th of the year ended the Devils 6 goal evening. Simply put-this may have been the Devils best 3 period game of the season and it certainly came at the right time with two of their next three games coming against the powerful Ottawa Senators. Hopefully this is the beginning of a trend,not an aberration. After months of basically begging the Pirates for a non-roster chance to return to Pittsburgh,Craig Wilson finally grew tired of waiting and signed a minor league deal with the Cincinnati Reds. Not sure what Wilson has left,but it could not have hurt to give the popular former Bucco a chance to bolster what looks to be a pretty weak bench. A good article from Slate on a favorite energy(and money) saver and environment enhancer of ours-Compact Fluorescent light bulbs. I have raved about them before,but well worth looking into,if you have not done so already. Two days away from the Maryland primary. I pretty much have decided where my vote will go and could post about it tomorrow or Tuesday,since both seem to be slow days. In a surprising move,the Redskins hired a favorite of ours in Jim Zorn to be the head coach in Washington. I always liked Zorn,but that will be a tough job as long as Dan Snyder owns the team and even tougher considering it will be Zorn's first job at a position higher on the food chain than QB coach. Only NASCAR could get excited about an exhibition race. Nascar has hit its peak and as I talked to Ryan yesterday about this,he offered an interesting point that it will always have its fans,always have a solid TV deal,but the peak is over. Battlin Bob fires back at County Commissioners! Here is the letter that Battlin Bob wrote to each of the Washington County Commissioners and the two responses that he received back thus far. I thought one was a reasonable response and someone that has at least a chance of realizing the importance of the Hagerstown Suns. The other-Likely will not be getting my vote. Disclaimer: The following thoughts are those of the guest author and not necessarily those of Thoughts of RS. Thanks for the email and comments regarding funding for a new stadium. I have stated on numerous occassions we should put public funding of a new stadium on a ballot and let the voters decide if they want the city and county to fund it. I think we both know how that vote will go. I do attend games and other events at the stadium but am not willing to commit pubic funds in the millions for a new stadium when the private owner is not willing to do the same, especially when we have higher funding needs for things like roads, schools, and public safety. I believe the last stadium campaign to raise funds did not achieve more than 50,000 several years ago. Again i'm all for putting this on a ballot for voters to decide. I don't disagree with what you have said and have worked with the Suns and their ownership for the last couple years in regards to a possible new or improved Stadium. I believe Will Smith can confirm my support. Unfortunately, several possible stadium projects have not materialized for many reasons outside of my control and the recent downturn in the economy seems to have quieted any plans that I know of by the Sun's ownership to push for the project. While I agree the money was for a large Tourism project (like a Stadium) we haven't had any of those offers come to the table as of yet. I hope, in the future, we can have an infrastructure project that comes before the board more suitable to the original intent of the funds. During this time, we have used that money for large economic development projects and a few other smaller events, including recent expenditures for Suns Stadium renovations as well as lighting for softball fields in Fairgrounds park to expand some softball tournaments bringing teams in from around the Country (the league sponsoring these events had records of over 200 hotel room nights in a weekend for these tournaments held throughout the summer). In regards to the revenue sharing, the County Commissioners have been getting a lot of pressure from our municipalities about returning the money collected inside their city limits so that they, not the Commissioners, can decide how best to allocate the funds. They also will have to follow the same usage guidelines as included in the State law. In fact, I can see Hagerstown's share (around $200k) being an asset to use to continue and improve upon upgrades to their Stadium at higher levels, but that will need to be supported by the council. We recently agreed to the sharing in order to help "keep the peace" and hope those funds are also used properly to draw in tourism dollars. This agreement does not preclude us from using the tax to fund a large project, including a Stadium, should that option materialize. Even with the sharing proposed, the County will keep the majority of the money to use as it sees fit ($over $500k/yr stays with County and only @$270k goes to municipalities) . If a new stadium option would materialize in the City, we could pool our funds to secure the project if that was the vote of each board. While I appreciate your desire for a petition, as a sun's supported, I believe that is premature until the ownership comes up with a workable project they are behind and committed to. Even the original plan for a new stadium that spurred the hotel tax years ago included significant financial support from the team as well as public and State backing. I do not believe the Sun's ownership is ready to to commit to that at this time. I would however, have your supporters be prepared to help lobby the council should the Sun's or City staff come forward with more renovation plans for the current stadium with the new hotel tax funds that the City will receive next year. Someone named Ryan Carter scored his first two NHL goals in the first period for the visiting Anaheim Ducks and it was enough to hold on and send the New Jersey Devils to their 6th loss in 7 games by a score of 2-1. The only Devil goal was on a second period Jay Pandolfo tip-in (9) of a Vitaly Vishnevski shot. The effort was there,but the goals were not as the Ducks Jonas Hiller played an excellent game for Anaheim. SO,not much else to comment on the game and since that is the case we will offer a few other Devil observations. This team has been showing a non-Dungy like attitude in not giving up,but the bad first period play has to stop! That has been the main difference in this losing span and something has to be done. Nope,but here are a few things worth giving a try to. 1)Try David Clarkson on the special teams. Clarkson's energy and grit have been the surprise of the year and maybe those qualities could perk things up a bit. Plus he is the type of player that can finish plays around the net and get the ugly goals that the Devils are not getting lately. 2)Mix the defensemen up . Andy Greene played last night for the first time in a while and looked pretty good,but I cannot remember the last time I saw Sheldon Brookbank,maybe a shakeup on the blueliners. 3)Add one of the Lowell players that are performing well. Petr Vrana,Barry Tallackson and Noah Clarke are playing well,maybe they can add a spark. I would add Nicklas Bergfors to the list,but he is out due to injury. 4)Maybe now is the time for the Lou to pull the trigger on a big deal to truly transform this team into Brent Sutters' team and attempt the change the talent pool. I have no idea if any of these would work,just some thoughts. Silver:Marty Brodeur-Good game,but offense fails to help. Bronze:Vitaly Vishnevski-Assist and continues to hit any object. A few thoughts on the return of Scott Niedermayer to New Jersey. I never minded "Neids" leaving other than the Devils losing one of the best players in the game. Scott was always a class act,not a mercenary type and I truly believe that had the Devils managed to obtain Rob Niedermayer (which the Lou tried for years with two different teams) Scott would still be a Devil. I never mind guys that leave teams because they want to play near home or other good reasons and that is why we bashed Scott Gomez and held Brian Rafalski blameless when both left this past off-season. But I really hate the trend in sports where veteran players start teasing retirement in order to avoid training camp and early season games. Roger Clemens started this stuff and Anaheim has perfected this with Niedermayer and Teemo Salanne. Ryan offered this point that I never thought of-Brian Burke (Ducks GM) planned this all along to wait until the cap space was available. The NHL needs to close this loophole ASAP. Stay tuned later in the day as Battlin Bob is on the warpath with this hotel tax. The Battler wrote letters to the county commissioners on this issue and tells us the Hagerstown City Council is next. We will post both his letter and the two responses that he has gotten back thus far,one of which seems pretty reasoned and the other basically says "oh,well". We stand by our previous statement-If you are an avowed opponent of Stadium improvements (at minimum)-you will not get this vote. This whole MSNBC David Shuster issue is a bogus one. Yes,but the term "pimp' has become so prevalent today,it is not quite as derogatory as it once was. None the less-I understand why the Clinton are mad,I might be too,but I would not handle it in the media. I would have just faced down Shuster-he would roll over,after all -that is what "michigan men" do best. And a final note on this to the nitwits at Fox. Having Laura Ingraham offer her crocodile tears on this is laughable enough,but could you at least spell Shuster's name right? I mean,geez-he used to be part of YOUR network at one time! Here is the final installment of the Erik Arnesen interview. Thanks again to Erik for doing it. RS:What do you do in the off-season,do you have a job or full time training for the season? EA:I spend a large amount of time training in the offseason. However, I do have an offseason job as an assistant office engineer and I also work in a baseball clinic. RS:How much time do you spend throwing in the off season? EA:I start throwing in January after the season. 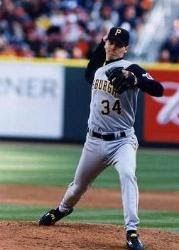 RS:Have you ever met Randy Tomlin,who would be your pitching coach at Potomac? RS:What do you like to do in your spare time,hobbies etc? EA: I like to spend my free time with my wife , family, and friends. I like to play games, watch movies, and play video games. RS:What is your top memory of last year at Hagerstown? EA:When I look back at the year my favorite part about it is how much I learned. RS:What was the nicest ballpark that you played in the SAL? EA:I think my favorite SAL ballpark we played at was Lakewood. RS:What was your least favorite SAL park? EA:I am not sure if I had a least favorite. I really enjoyed every ballpark we went to. The Devils battle the Ducks tonight in Scott Niedermayer's first visit to Jersey since leaving the team for Anaheim. IF I have time,I may be back later with some thoughts on this. Sean Burnett did clear waivers and was returned to the Pirates as a non-roster player. Burnett will likely return to AAA Indianapolis. The New Jersey Devils fought back from a two goal (and controversial) deficit to force overtime and add an unlikely point to the standings in Buffalo before losing the shootout in a 3-2 loss to the Sabres. Buffalo led 1-0 at the end of a period and increased the lead to two on a controversial and long reviewed by the video groupies in Toronto. The second period goal by Jason Pominville was clearly kicked by the Buffalo winger,but after a delay to review by Kris King and his minions was declared to be a legal goal. Instances like this (and in the NFL) make me wonder why they even bother with replay. goal in the second by Karel Rachunek (3). Rachunek's play has been picking up since his return from the IR with being a little more aggressive in the offensive zone and that is what New Jersey is looking for from the finesse' defender. Mike Mottau connected with his 3rd goal of the season in the third period to knot the game at 2 and although the Devils could not break the tie,they were able to control play in the period. After a scoreless overtime that saw Buffalo score with shots,both Zach Parise and Brian Gionta were both denied by Ryan Miller and the Devils returned home with 1 point instead of two. I like the heart that the team has been showing by not quitting,but it would be nice if they didnt fall behind so much to show that heart! The Devils will play back to back games on Friday and Saturday against the Ducks and Hurricanes at the Rock. Bronze: Vitaly Visnevski-Some hard hits made some Sabres hesitant to rush the net. Almost forgot to give a compliment to Versus from their coverage on the Devils game vs Pittsburgh on Monday. I was all prepared to hammer them for their less than great announcing,so what do they do? They get Doc Emrick for the evening,pair him with the underrrated Ed Olczyk and the very good Chris Simpson at ice level. I hope to see more of this three person crew during the playoffs. The Seattle Seahawks hired (as expected) Jim Mora Jr as the Hawks coach in waiting this season before taking over as the head man in 2009. We aren't enamored of the former Falcons boss and like the coach in waiting tag even less,but there are worse hires out there-Denny Green anyone??? HBO has canceled "Inside the NFL" after 31 seasons on the premium cable network. I used to be an every week viewer,but after adding Dan Marino (twit),Cris Carter (How bad are you when I cannot stand a Buckeye?) and Cris Collinsworth (Bad beyond belief), I rarely watched anymore. Speaking of Inside the NFL,we visited the Hall of Fame one year and the show was filming there that day when Nick Buoniconti and Len Dawson were the hosts. We saw Dawson walking around,but talked to Buoniconti for a bit and he signed a flyer for us. Want to know why we have lost a lot of interest in college basketball from a former live and die with Maryland Basketball fan? "Tonight on ESPN,Rivalry Week continues with Maryland vs Boston College". The ACC has killed itself and I think "Bones" McKinney just rolled over in his grave. Finally Battlin Bob sends us this link from Washington County and its commissioners on wanting to redistribute the hotel tax to the various towns in the county. Yep,the same tax that was created to help the Suns build a new stadium is not getting to its intended source. That is it-I am running!! Tuesday is my most exhausting day of the week. This could be a three post day,if things fall right and I have the time to post. This one covers the great Devils comeback Monday over Pittsburgh and a few bullpen notes. The New Jersey Devils were down 3-1 in the third and as I watched the game,I was already thinking about how to write about the anemic offense and things that could happen to shake this team up a bit. The only bright spot was a late second period power play goal by Jamie Langenbrunner(9) to give the Devils hope at intermission,but a Pittsburgh goal early in the final stanza seemed to dim that hope. The Devils seemed like a team that was headed to another loss and seemed to be playing on auto pilot,but suddenly that changed. Patrik Elias took the puck deep in the corner and with the creativity that he has the ability to showcase(and does only on occasion) with his puckhandling eluded a Penguin defender and fired a shot off the Penguins Kris Letang and into the net to cut the lead to 3-2. Elias and his 16th goal of the year seemed to inspire the Devils as the intensity picked up and began to overwhelm the Steel City gang. David Clarkson then slammed his 7th goal off a rebound past Ty Conklin to tie the game and send the Penguins reeling against the boards. Clarkson just needed an assist to complete the Gordie Howe hat trick after a first period battle with Ryan Malone. New Jersey continued the pressure and on two occasions,just missed goals that would have ended this one in regulation,however the Devils would not need much of the extra time to put the unlikely two points in their column. Elias took off down the ice with the puck after Marty Brodeur had cleared it to him and fired at Conklin,but Zach Parise was cutting to the net and redirected the puck past a stunned Conklin for the game winner in a 4-3 win! Brodeur getting a rare assist for a goalie on the play and Elias getting his 2nd assist on the night. The win was a great one,but the effort early left plenty to be desired and certainly needs to be addressed. The Devils travel to Buffalo tonight at 7. New Feature here for the Devils for the players of the game. Today is the announcement of the number one recruit in the nation,quarterback Terrelle Pryor. Pryor is expected to choose either Ohio State or Michigan. Here is hoping that he makes the right choice. Freddy Sanchez did sign a extension with the Pirates yesterday at a reasonable price. 19 million total for two guaranteed years and an option season,but the most interesting part was the lack of a no trade clause. So,with Sanchez under contract at a very affordable cost,get ready to hear the name of Freddy Sanchez around the trade deadline. Here is a link to what Ashland high expects to do with their stadium after the Ashland University Eagles are able to get their 7,000 seat stadium up and built. This began my thinking on this though. You have a town half the size of Hagerstown that is refurbishing their high school stadium to attract events,put in a new FieldTurf playing surface etc. Their counterparts at Ashland University,which is a private Division II school,plans to build two brand new stadiums for their football and soccer programs at a cost of 24 million. Now look at Hagerstown,a far bigger and prosperous city,which has professional baseball at a facility that needs either a complete renovation or replacement. The Suns have to wheel,deal and squeal for years to just get a new infield! Here is Part 3 of the Erik Arnesen interview and some bullpen notes at its end! RS:What Sun did you spend the most off field time with in 2007? EA:During the season I spent most of my off field time with my roommates Jeff Mandel and Robby Jacobsen. RS:What was extended spring training like and who and how told you that you were assigned to Hagerstown? EA:I did not find extended spring to be that bad. I missed a lot of Spring Training due to back spasms, so extended spring I used as my spring training. RS:Your opinions on Tommy Herr and thoughts on this game. EA: Tommy Herr is a great coach and I enjoyed playing under him. Paul (Menhart)is an amazing pitching coach, I learned a lot this season and it started to really come together at the end of the year. 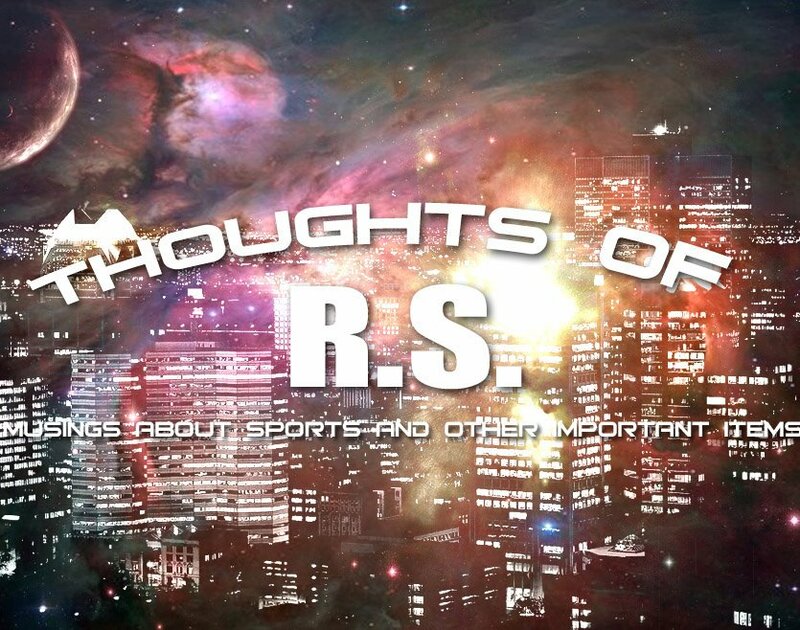 RS:Has the Nationals organization given you any pitches to work on in the off-season? EA:I am going to work on all of my pitches this off season, but I will probably focus a lot of time on my changeup. RS:What do you think is your out pitch? EA:My out pitch really depends on the situation, and I think I can get outs with all of my pitches. RS:Has anyone given you any indications on whether you will start in Potomac or Hagerstown in 2008? EA:I will not know where I am playing until they let me know in Spring Training. Topps baseball cards has announced that they will be making cards of this years Presidential candidates with this years baseball set. Candidate cards are supposed come at a ratio of 1 to every 9 packs. Devils in action tonight vs the Penguins on Versus,so no "Doc and Chico" tonight. Thrilled that the Patriots lost,although the Giants were not altogether classy in victory. But then again,New England had it coming. Personal favorite Tom Brady was "surprised" at Plaxico Burress' prediction. He gave you too much credit. Am I the only one that finds the Patriot offense boring? Watching 45 5 yard passes a game gets kinda tedious,doesn't it? Looks like the Democrat side is going to be a fun day,as just as I begin to toy with Barack Obama,he wheels out Oprah Winfrey and makes me wonder all over again! Oprah being around always makes me question anything that I find out that I agree with her on! Here is part 2 of our interview with Erik Arnesen. RS: Is your faith an important part of your life? EA:My Faith is the most important aspect of my life. My relationship with my Lord Jesus Christ is my highest priority. RS: If so,is it difficult to be a Christian as part of the everyday game? EA: As part of everyday baseball I do not find being a Christian difficult. Actually, I would say the opposite in that my faith helps me through the good times and the bad. RS:Did the Nationals negotiate with you or was it a standard "cookie cutter' senior contract offer? EA: It was a standard senior sign contract. RS:What do you remember about your first game in Vermont in the NY-Penn league? EA:My first game in Vermont was exciting. At that point, it was definetly the largest crowd I had ever pitched in front of and it was awesome. RS:Thoughts on your tenure in Vermont? EA:I really enjoyed my tenure in Vermont. I learned a lot and really had a good time. RS:Do players have the right to pick their own roommates on the road or does the team/manager pick them for you? EA: Roommates are decided by the coaches/trainers, but they usually try to pair you up with someone you want to be with. RS:Have you made any good friends in your two seasons in baseball? if so,who? EA: I have made some very good friends in my 2 years playing. Devils stop skid behind Colin White!? The New Jersey Devils could not have asked for a better scenario to snap their three game losing streak than a home game against the leagues worst team in the Los Angeles Kings. And they did just that in a 6-3 win over the Kings that featured both a goal and an assist from Colin White,who I think scored his last goal against the California Golden Seals during the Nixon administration. Just kidding,but White's last goal was almost two years ago and even he seemed surprised when his second period shot off of John Madden's faceoff win eluded Jason LaBarbera. White's assist came on the only goal of the first period,which was fired in by David Clarkson with a nifty shot that he flipped in with almost a flinging motion. It was the sixth of the season for the gritty Clarkson. Patrik Elias scored his 15th goal early in the second before the Kings trimmed the lead to 2-1,but Karel Rachunek (2) moved the lead back to 2 just 75 seconds later and began the pattern for the remainder of the game. That pattern was this-Los Angeles would creep into shouting distance and the Devils would score shortly thereafter to put things "right". The Rachunek goal was set up by a pretty pass from the corner by the Captain Jamie Langenbrunner. Langenbrunner is a highly underrated passer and I think that he easily is the best passing non-center on the club. 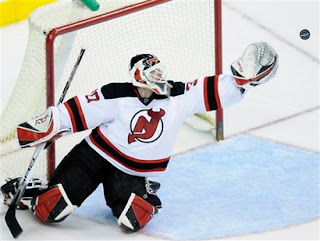 Los Angeles then cut the lead to 3-2,but just 33 seconds later was White's goal and with just four seconds to go in a huge second period for the Devils,Travis Zajac shoved the puck(12) through traffic for a 5-2 lead at the intermission. The Kings would score 1 goal in the third,but Sergei Brylin (5) tallied the final goal of the game just under two minutes later. A good effort by the Devils,albeit sloppy at times. New Jersey battles the Pittsburgh Penguins on Monday. Sometimes having the best play by play man to listen to every night is something you take for granted,but when Doc Emrick is doing NBC games and Steve Cangelosi fills in-you don't take it for granted very long. It is not that Cangelosi is horrible,just that anyone is going to pale in comparison to the best. The Football Hall of Fame announced their inductees yesterday and they do'nt get the scrutiny that baseball does and it is a good thing because every year guys get in that you roll your eyes about. And this year they didn't even put in the right players! Darrell Green was a layup,Art Monk had gotten screwed over for years and Gary Zimmerman was a dominant offensive tackle. But Andre Tippett and Fred Dean? They were not even the best selections at their POSITION on the BALLOT! Randy Gradishar was a better linebacker than Tippett and Richard Dent was a much better defensive end than the one-dimensional Dean. For a good laugh,check this out at our friends at Bag full of Politics,where the discussion is your humble blogger for City Council! LOL! I am not sure that this town is ready for that! I will try to get Part 2 of the Erik Arnesen interview up later tonight or tomorrow.